Conspiracy charges are particularly difficult to defend in court. In many situations, federal conspiracy charges are added to a person’s record to increase the severity of the potential penalties a person faces. Often, federal conspiracy charges greatly increase the fines or prison terms of convicted individuals. It can be helpful to understand how these charges arise as well as how to create a strong defense. Federal law classifies conspiracy as a criminal offense that occurs when two or more individual plan to commit an offense against the United States, to defraud the United States, or to defraud any agency of the government. To be charged with conspiracy, the two individuals who conspire together must not be federal agents, law enforcement officers, or confidential informants. The exact penalties that a person can expect to face in association with a federal conspiracy charge depend on the severity of the offense that is involved. 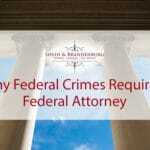 Creating a strong defense to a federal conspiracy charge can be particularly challenging. While federal prosecution is required to establish that conspiracy occurred, the prosecution does not need to provide any written proof that the conspiracy existed. Instead, the prosecution can establish its case by preventing any evidence that two individuals worked together in some way or had an implied agreement. One of the most common defenses in response to federal conspiracy charges is to show that the defendant did not knowingly or willingly engage in the acts. Another common defense is to show that a person knowingly withdrew from the conspiracy before the offense occurred. A defense of withdrawal can also be used if the defendant convinced other individuals engaged in the conspiracy that they no longer want to participate in the offense. Individuals can also raise withdrawal defenses if they performed actions that were inconsistent with the conspiracy. There are many other defenses that can be raised in response to a defense charge. A skilled federal defense lawyer can evaluate your case and determine the best possible defenses given the evidence. People charged with federal conspiracy charges almost always need the assistance of an experienced defense lawyer. 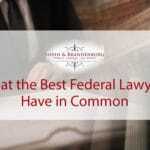 The knowledgeable attorneys at the Federal Criminal Law Center can help understand the severity of the crimes with which you are charged as well as what steps can be taken to protect your rights. Contact our law office today to schedule a free case evaluation. This entry was posted in Criminal Defense, Fraud Conspiracy and tagged criminal defense attorneys, Federal Conspiracy Law. Bookmark the permalink.